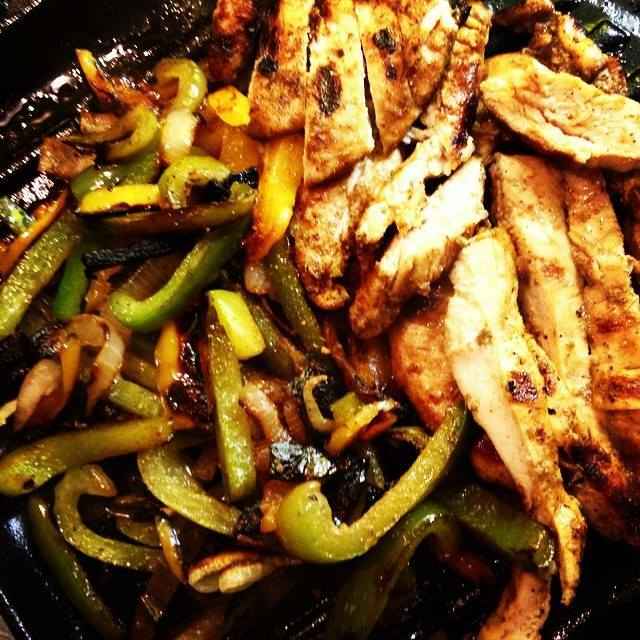 Fajita’s need no introduction. You order them at a restaurant and you need an extra table to fit all the sides, but my motto is simplicity, so here’s a recipe that takes no longer than 30 minutes to make! The only thing that I insist you use while cooking is a griddle pan, because it makes the chicken taste so much better! Sprinkle the taco seasoning and salt and pepper to taste over the chicken fillets. Heat your griddle pan on a medium heat. Once it’s hot add around 2 Tblspn oil and spread the vegetables over evenly. Sprinkle with some salt and pepper. After a few minutes flip the veggies over. Once the veggies begin to char, add the chicken to the pan. I usually just add the chicken on top of the veggies, then once it starts cooking I move the veggies to the side and place the chicken directly on the pan, and it doesn’t stick, but still gets charred. Flip the chicken after 5 minutes and let it cook for another 3-4 minutes before turning off the heat. Then all you have to do is slice the chicken and split charred goodness between tortillas, top with salsa and eat! You can add shredded cheese, lettuce, guacamole and all the extras, but try it with some simple salsa first and you might just skip the rest! And also, there’s a fine line between grilled chicken and veggies and burned chicken and veggies, so if you notice everything turning black very quickly, lower the heat!